This is the menu - the photos are arranged by loco class, location or train type. More sections will be added as time allows so keep an eye on the "Updates" page for new additions. A recent incident has, sadly, made it necessary for me add the following note. I hold the copyright to all photographs shown on this site. It is a breach of this copyright to copy them for whatever reason without my permission, and legal action will be taken against any party found to be doing so. Additionally, a reproduction fee of £250 per image will be charged. Please click on the links below to access the different sections. This website is hosted by 1&1 and I can say quite honestly that there have been no problems or downtime at all in the 6 years I have been with them. For more details on the hosting packages please click on the banner at the foot of this page. Miscellaneous, or odds and ends. 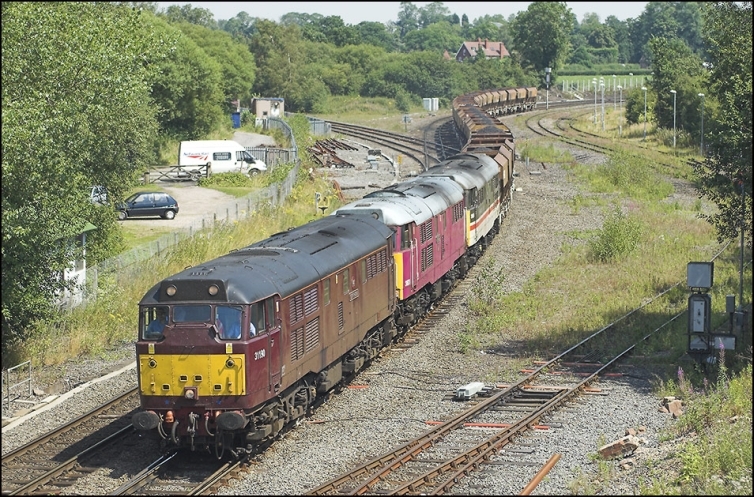 The colourful triplet of 31190, 31601 & 31454 at Whitacre Jct on 25/7/2006 with 6G20 13.00 Daw Mill - Rugeley PS.